We’ve talked about how good baths are for stress, muscle aches – pretty much whatever ails you. Now it’s time to think about giving the gift of a great bath to your friends, family or favorite teacher. 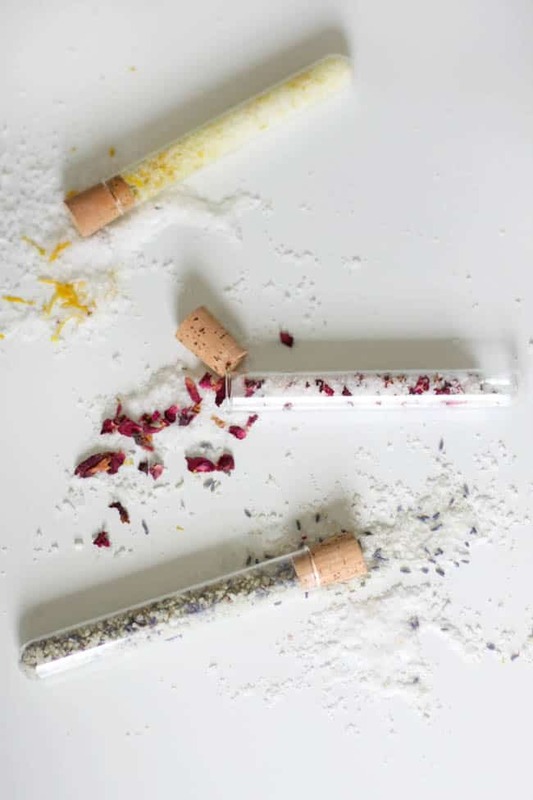 These bath salt test tubes caught my eye on Anthropologie ages ago, and I finally found a few test tubes so I could try them out. Melt 2 tablespoons of cocoa butter in a medium glass bowl. I use a makeshift double broiler approach with the bowl sitting on top of a saucepan with a couple of inches of boiling water. You could also use a couple of quick bursts in the microwave. 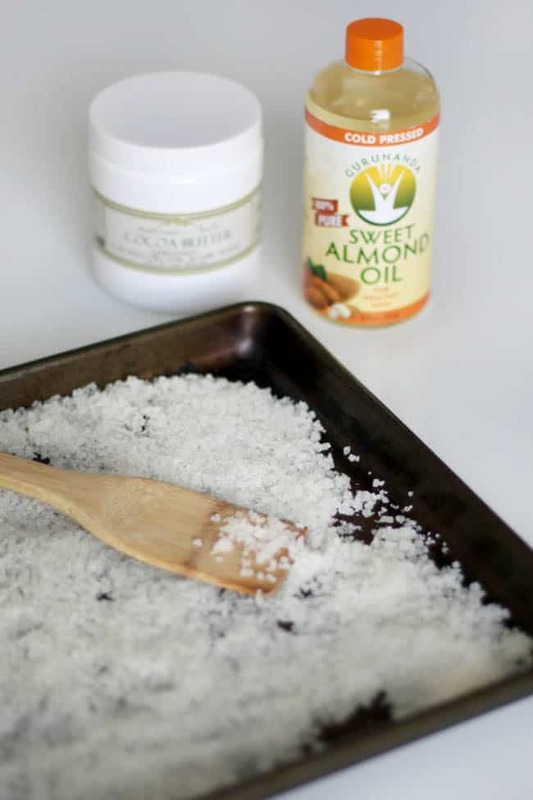 Remove from heat and add 2 tablespoons of almond oil. Pour in two cups of sea salt and stir until butter and oil are evenly distributed. Spread the salt out on cookie sheet and let it air dry. This will take about a day. 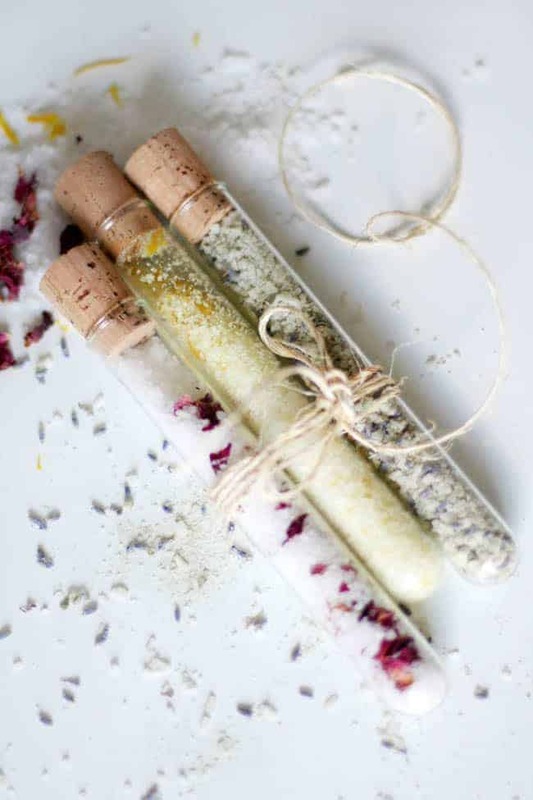 Pour salt into test tubes with desired ingredients. Here are three variations I came up with, but anything goes! My test tubes each held between 1/8 and 1/4 cup of salt so you can make several gift sets at once. Tie the tubes together with a bit of twine and you’re all set! Can we use any other essential oil instead of almond oil? What is the shelf life on these with the zest? 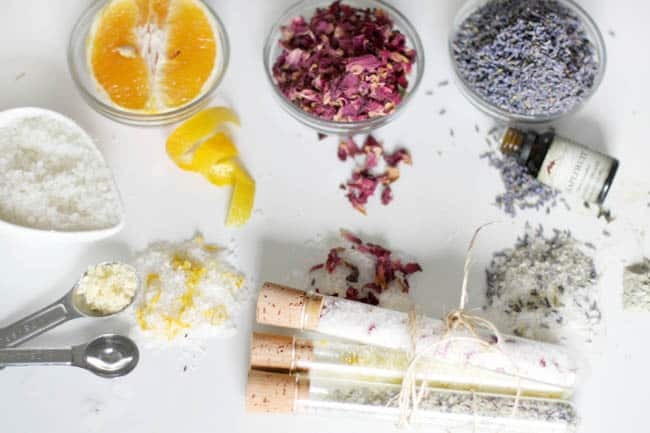 Do you need to let the salt dry again after adding the essential oils? Or can I package right away? I’m planning to do these as my mom’s group Christmas party and I’m hoping to let them take them package and take home after making. Thanks! These are lovely. This is a great idea. I’m going to link to it in my weekly newsletter. What a perfect Xmas gift to make. Thanks for the beautiful photos too. Very good ideas. i love making bathsalts. I’ ve made some bathsalts as well. Also with roses but in addtion with rosemary. This one is very good for a relaxing bath. I did something similar last year as Christmas gifts but used mason jars. The tubes are way cuter. Love this idea. Fantastic idea! I ‘ll pin it to make them and maybe give them as party favors! I love this idea! I am definitely making these for a few friends for the holidays. This and your DIY Green Tea + Coconut Oil moisturizer :) Thanks for another great post!